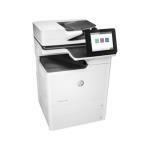 HP LaserJet Enterprise M681DH Expert Reviews - Read Reviews and Buy Smarter Online. Verdict: Very statuette in profile and copies faster than one can say "copy." With REt 3600 using 1200 x 1200 resolution, it is as sharp as a tack! Then there is the user interface - what a delight.